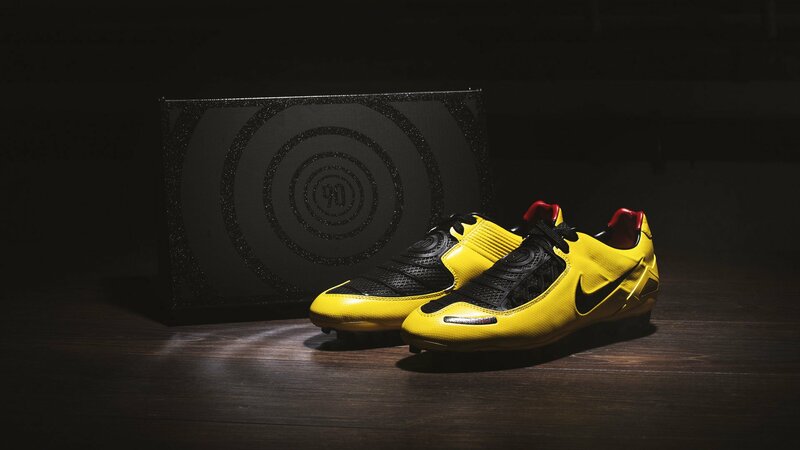 Nike re-releases a total of 2000 worldwide numbered Total 90 Laser 1, bringing your tackles and shots to another level. With its unique strike zone and level of durability, the hard working midfielder and the strong striker will bring home the victory. Read more below, but act quickly if you want this limited edition piece of history. SOLD OUT! Didn't get a pair? Find all of our other limited edition football boots and sign up for those to come in the future right here. 'Put it where you want it.' No, it’s not what you think - this is what the slogan when Nike launched the first Total 90 Laser sounded like - and now, the ultimate toughness boot is back. With the release of the, Limited Edition Total 90 Laser 1 Remake, Nike follows the re-releases and brings back the OG T90 Laser 1 from 2007 with a more or less 1-to-1 upper to bring back the retro vibe of the the mid-late 00's. Back in 2007, Nike found that 69% goals were taken with the instep, so they created the shot shield with a bigger, cleaner striking surface to reduce the variables when shooting. The result? These precision and power rings to give you the most optimal, punchy and precise shot possible. Just like the original Nike T90 Laser, the Limited Edition Nike Total 90 Laser 1 Remake is all about toughness and accuracy. Although star midfielders like Gennaro Gattuso, symbolizing tougness, and Luis Figo, the master of accuracy, also wore the boot back in the days, the footballer most synonymous with the Nike T90 Laser was the one and only Wayne Rooney, who possessed both key attributes in the Nike Total 90 Laser DNA. The 2019 remake also features the Nike Zoom Air tech for superior flexibility and cushioning and a skeleton print on the outsole and hexagonal studs for traction. The Limited Edition Nike Total 90 Laser 1 Remake is the definition of nostalgia. You can't look at this legendary beast without thinking Wayne Rooney, Luis Figo, Gennaro Gattuso, Fernando Torres etc. The amount of epic images in your mind is unreal. And now, Nike really spoils us with a re-release. Just pinch yourself in the arm - this isn't a dream! Find all of our limited edition football boots and sign up for those to come in the future right here.